NatureWorks releases today the first findings of its updated eco-profile for its naturally advanced family of Ingeo™ biopolymers. The revised profile, which is based on the latest version of PE INTERNATIONAL’s GaBi LCA software and database, follows the ISO 14040/44 standards and reinforces the fact that the production of Ingeo polymer emits fewer greenhouse gases and consumes less non-renewable energy compared to commonly used plastics such as polystyrene (PS), polyethylene terephthalate (PET), and polycarbonate (PC). The eco-profile of a polymer gives information such as the total energy and raw materials consumed, and the total emissions to air, water, and soil from the cradle to the finished polymer pellet. An eco-profile is an essential input to any full life cycle assessment (LCA) conducted on consumer products made from that polymer. NatureWorks works closely with brand owners, manufacturers, universities, and other research groups in using life cycle assessment to compare the impact of various material types on products. “Our most recent eco-profile in 2010 was calculated using the methodology, the modeling software, and core database in place at the time,” said Erwin Vink, Environmental Affairs Manager, NatureWorks. “The same approach was used by such industry organizations as Plastics Europe since the beginning of the nineties to calculate the eco-profiles for the fossil based polymers. However, LCA tools and databases have progressed in the past four years, and we decided it was time to recalculate the eco-profile based on those advancements. NatureWorks teamed with PE INTERNATIONAL, one of the world’s leading LCA consultants, basing the update on PE´s GaBi6.3 modeling software. PE INTERNATIONAL subsequently reviewed the methodology used, the final modeling work as well as the use of upstream data by NatureWorks, to determine the 2014 eco-profile and found that the company’s LCA process was scientifically and technically valid and consistent with ISO 14040 and 14044 standards for conducting LCAs. 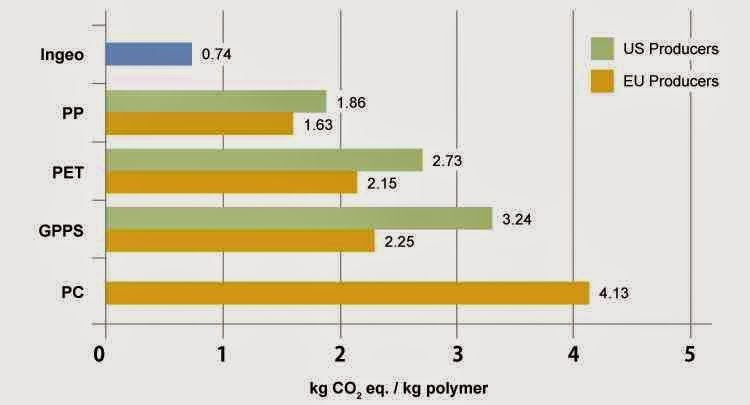 The most recent recalculated eco-profiles for Ingeo, PP, PS, PET, and PC show smaller overall greenhouse gas emissions for each polymer compared to previous European industry data. The ranking of the polymers from lower overall environmental impact to higher overall impact remained the same. The chart below compares the greenhouse gas emissions (including biogenic carbon uptake in the case of Ingeo) for Ingeo manufacture with the emissions resulting from the manufacture of a number of different polymers produced in the US and Europe using the latest available industry assessments for each. The numbers represent the totals for the first part of the life cycle of the polymers, starting with fossil or renewable feedstock production up to and including the final polymerization step. The new Ingeo eco-profile information is expected to be available shortly in industry life cycle inventory databases. In the meantime, for further information, see the NatureWorks eco-profile page. In the near future, LCA practitioners interested in accessing the full eco-profile will be able to download it in such file formats as xls and GaBi.